Another meme bashes Kobe Bryant and the Los Angeles Lakers, using Pau Gasol to show the difference between playing next to one of the most selfish players in the NBA and being a player on the Chicago Bulls, where TEAM comes first. Photographs often lie. They capture a frame, a moment in time, which without the right and actual context can be manipulated and understood in the wrong way. 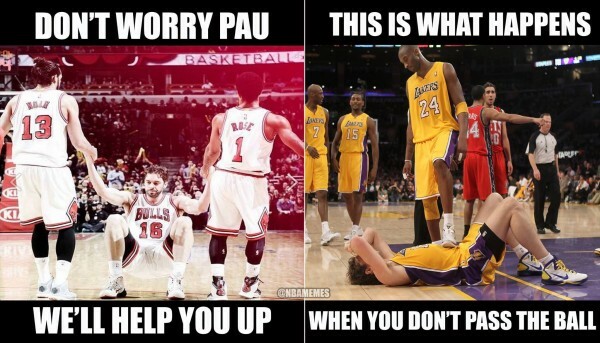 This meme, which makes it seem like Kobe Bryant isn’t going to help Pau Gasol up, but he probably did a second later. Bryant has never showed nothing but respect and love for Gasol, a player that if the Lakers hadn’t brought in via trade, Kobe Bryant might still be looking for his fourth championship ring and first without Shaquille O’Neal. But Gasol is happier with the Bulls. First of all, because they’re relying on him, and he isn’t with a coach he publicly hates and vice versa. And he’s on a winning team, instead of the semi tank job that’s going on with the Lakers. Well, it’s not really a tank job – they’re pretty bad without actually trying to lose. But as we’ve written a number of times this season, Kobe Bryant is a big part of whatever it is that’s wrong with the franchise. His ego might be a bit subdued to the backlash over his shooting numbers and his selfishness, but it doesn’t take away form the complete and utter blind following after what in his age is something of a false prophet when it comes to promising the Lakers good fortunes. It’s his presence, his contract and his behavior that’s been dragging the Lakers down for the last three years, and no one in the franchise was brave or smart enough to stop it from happening.